Last year, we invited Damian Lentini from Haus der Kunst as our guest curator to realize an exhibition idea in the Apartment of Art. The cooperation has been very much delightful and meaningful so that we would like to further expand this approach this year. It is our big pleasure to invite Nina Holm, a young curator from Kunstraum Munich. She has developed an intergrated exhibition concept with artist Isaac Chong Wai which starts with "Chapter A: The Rehearsal of the Futures at the Apartment of Art" and then it unfolds into Kunstraum Munich with "Chapter B: An Artistic Archive of Borders". The non-profit independent art institutions in Munich support and rely on each other to develop and implement synergies. This can be seen in the exhibition concept developed by Nina Holm in particular. Isaac Chong Wai is invited to show his first exhibition in Southern Germany with a 3-channel-video installation "One Sound of the Futures" in which a performance took place in three different cities in Gwangju (South Korea), Wuhan (China) and Hong Kong in Asia. The participants of the performance are invited to stand as if living sculptures in three different locations and speak or proclaim how they imagine their personal futures, what they expect and promise for themselves and what they would dream of in the foreseeable time. Hundreds of voices of people were resonating at the same time to create a landscape of sound that becomes a vibrant potpourri of a draft of the futures. In the video, the individuals' stories are captured with the audible sound and subtitles. All places of the performance, namely Hong Kong Kai Tak Runway Park, Gwangju 5.18 Democracy Square and WuHan K11 Artist Village, have a common connection that the locations or the cities are loaded with historical significances in their countries in regard to the upheaval movement in history. The rupture between the past and the present manifests itself in the personal dreams and expectations, and also the worries and concerns towards the future. 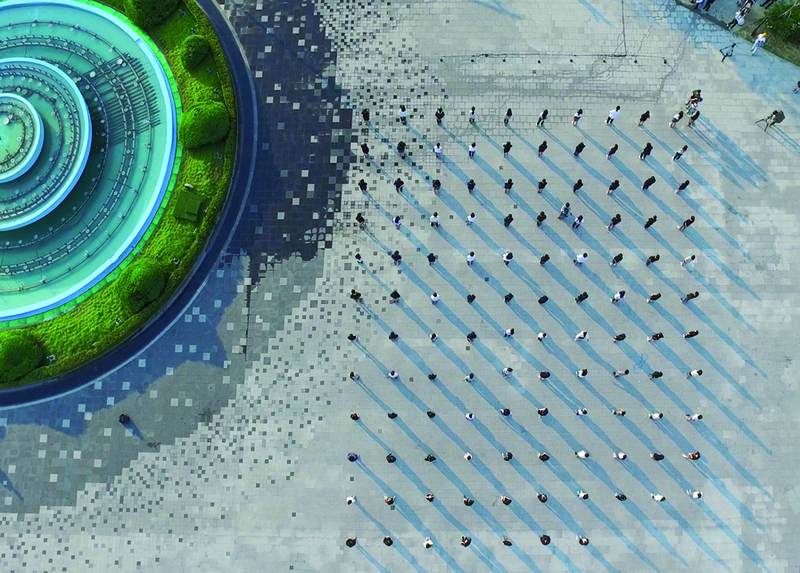 Lined up in a stringent formation, which can be seen in the video, conjures up a solemn and energetic moment that makes it clear that those who deal with the future also process the past. In his works, he engages themes of collectivism and individualism, politics of time and space, border, migration, war, militarism, racism, identity politics, LGBTQ, public sphere, and human rights. The artist was born in 1990 in Guangdong and grew up in Hong Kong since he was two. After finishing his studies at the Academy of Visual Arts at Hong Kong Baptist University, he studied for his MFA in Public Art and New Artistic Strategies at the Bauhaus-Universität Weimar. He lives in Berlin and Hong Kong. Here is a list of his projects and exhibitions. "Chapter B: An Artistic Archive of Borders", the second part of the exhibition project with Isaac Chong Wai, is presented at the Kunstraum Munich from the 29 May to 08 July 2018. It is dedicated to the emergence of borders and their associations in the current world. The temporal overlap of the two exhibitions of one week opens up the possibility to get to know the different facets of the artist's work and to immerse oneself in the content superstructure of his work.